Nathan Emmerich of Queen's University, Belfast, finds that Laura Stark's book and my own "together . . . illustrate the nature of ethics as an aspect of research governance fundamentally contributing to our understanding of the phenomena in a manner that goes beyond the relatively limited or restricted consideration offered by applied ethical analysis." Emmerich detects what I agree is a difference between the two books' conclusions about the IRB system. "For me the question at stake when reading both authors," he writes, "is whether the contemporary American IRB is well suited to the ethical governance of biomedical, behavioral and social scientific research . 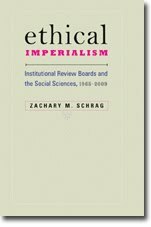 . . One can interpret [Schrag] as thinking the IRB, at least in its current form, is not well suited to social scientific research. Stark however comes at this question more tangentially and whilst she is aware of some difficulties she does seem broadly in favor of the current arrangements." But he also finds some agreement: "Both Schrag and Stark argue that, in the actual practices of the IRB . . . flexibility is conspicuous by its absence. Instead IRB's tend to develop relatively determinate and static positions on particular issues raised by research ethics that, once inaugurated, become generically applied across research proposals in a variety of disciplines." Doubting that such generic application will produce good results, he calls for "disciplinary experts [to] engage with the contemporary bureaucratic institutionalization research ethics in higher education sector of the UK and the administrative tasks local to their own [Higher Education Institutions] and departments." I hope they heed his call.